Go apple picking. Find an orchard near you that allows you to pick your own apples! Watch the leaves change. Visit a local park, or find a road to drive that gives you the greatest views of the changing fall trees! Bake a pie. Apple and pumpkin are favorites here! Go to the pumpkin patch. Pumpkin patches aren't JUST for buying pumpkins. Many also feature fun corn mazes or hayrides too! Carve a Pumpkin. If kids are too young for carving, consider painting instead. Rake the leaves...and jump in them! Not only does it make the yard look cleaner, but the jumping in after is a blast...and a great photo opp too! Make leaf prints. Use crayons and paper to make fun fall leaf prints! Paint with Apple. Check out this fun post for more info. Make caramel apples. These fun fall treats are as delicious as they are easy! Go to the zoo. Not only do the crowds tend to be smaller in the early fall, but the weather is much more bearable than crazy summer heat too. Bake pumpkin seeds. Leftover seeds from pumpkin carving can make a fun easy treat to make and eat as a family. Have a bonfire. Many think of bonfires as a summer activity but I personally prefer them in the fall! For older kids, this can be a fun time to tell semi-scary ghost stories as Halloween draws near too! Have a family game night. When the cool weather keeps you in, bring the fun in too with a fun family game night! Collect acorns. Use for decor, or get creative with them! Have a fall themed nature scavenger hunt. Collect various color leaves, acorns, sticks and more! Make apple cider. Who doesn't love this fall drink!? Make a bird feeder. Check out this fun post for just one example! Make a scarecrow. We all have old clothes we no longer need, repurpose them into a fun fall scarecrow!! 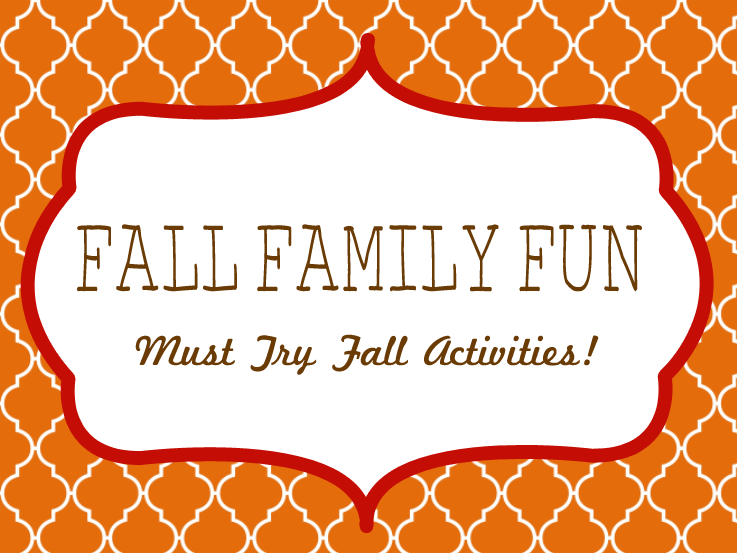 What are your must do fall family fun activities? We have a similar lists of fall activities we call it our "Fall Bucket List". Oh I love these!! I always do the same things and yet feel like I miss out on so much!! This is such an amazing list!! We've already done apple picking and hay rides!! So much more left! !